Conservative commentator Tomi Lahren has become one of the most prominent voices of right-wing politics. Her rise to conservative media star has been defined by fearless video rants about everything from pop culture to politics, and she's also stirred up a lot of controversy along the way. She catapulted on America's radar when a segment on the One American News Network called "Final Thoughts with Tomi Lahren" went viral. A headline-making gig with Glenn Beck's The Blaze followed, and as her profile increased, Lahren took swipes at everyone from pro football player Colin Kaepernick to former first lady Michelle Obama. She compared the Black Lives Matter movement to the Ku Klux Klan, criticized Barack Obama-era programs such as the Affordable Care Act (ACA) — while she was actually benefiting from the law, and even "taunted" students affected by mass shootings. It's no surprise that Lahren's powerful points of view have attracted some haters over the years. From a shmoney move-making rap star to politicians and even a colleague in the conservative news biz, here are some celebrities who can't stand Tomi Lahren. This feud reportedly started in January 2019, when the Invasion of Privacy rapper spoke out against President Donald Trump for is role in a historic partial government shutdown, precipitated by a fight over funding for a border wall with Mexico, that left some 800,000 federal employees without income. Conservative commentator Tomi Lahren blasted Cardi B on Twitter with what appeared to be some major sarcasm, calling the musician the "latest genius political mind to endorse the Democrats." Cardi responded: Leave me alone or I will dog walk you." But this TV host is never one to step down from a challenge. 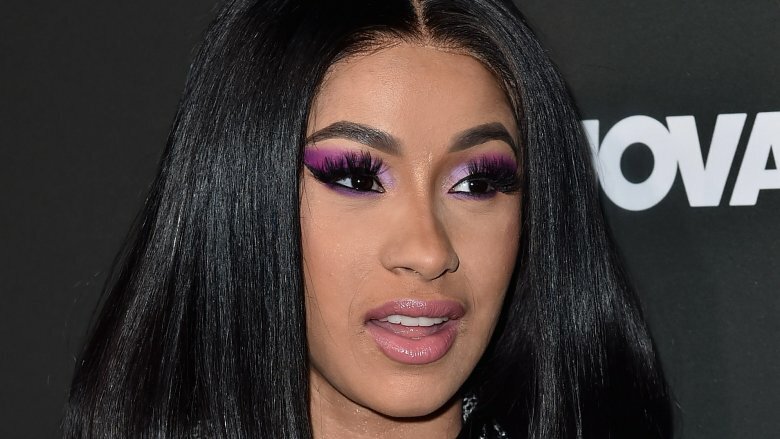 Lahren threw another barb, calling Cardi's "political rambling … moronic." That was apparently the last straw for the "Money" rapper, who followed up with a fiery tweet calling Lahren a "sheep … blinded by racism." That last shot garnered a lot of support from Cardi's fans, including a tweet from fellow Bronx native and U.S. Rep. Alexandria Ocasio Cortez (D-N.Y.). "Why do people think they can mess with Bronx women without getting roasted?" quipped Cortez. 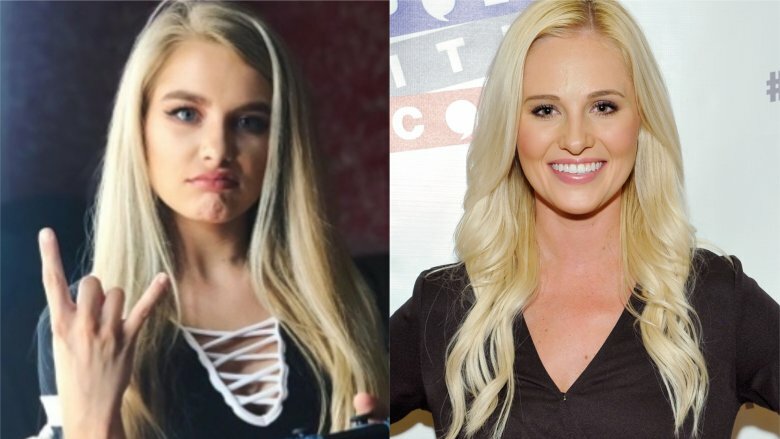 "They act as though our borough hasn't been perfecting the clapback game since the Sugarhill Gang…"
Whatever you do in life, do not tell reality star Demi Burnett (pictured left) that she looks like Fox News contributor Tomi Lahren — unless you're ready for a serious tongue lashing. Such was the case in January 2019, when a Twitter user compared Burnett, a contestant on The Bachelor, to the fellow blonde via a photo of the two side-by-side. "Do not disrespect me like this," Burnett firmly replied. "Lotus Flower Bomb" rapper Wale made his disdain for Tomi Lahren public when he released his 2017 song "Smile," in which he name-dropped her while taking a shot at the alt-right — except he mistakenly called her "Tammy" (via Complex). Lahren would later check him on Twitter for the blunder, but it only made him troll the commentator with the misspelling again, which resulted in a bunch of Twitter users calling her everything but her given name, from "Tabitha" to "Tamborine" (via New York Magazine). 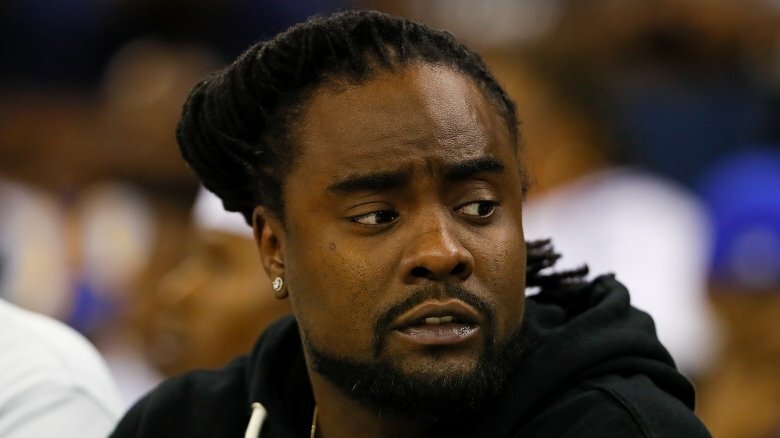 As the years ticked on, Wale continued to go at Lahren, like in 2018, when didn't take too kindly to her criticisms of former first lady Michelle Obama. Wale tweeted: "Just say you threatened by the power of black women and go Tammy.. you and your zany hijinks won't prosper today." When Lahren called out some JAY-Z lyrics, Wale dished it out again, referencing a viral video of Lahren spitting bars to a 21 Savage tune whose lyrics are arguably just as controversial as some of the tunes in JAY-Z's catalog. "Go and sit down my friend," Wale declared (via Billboard). 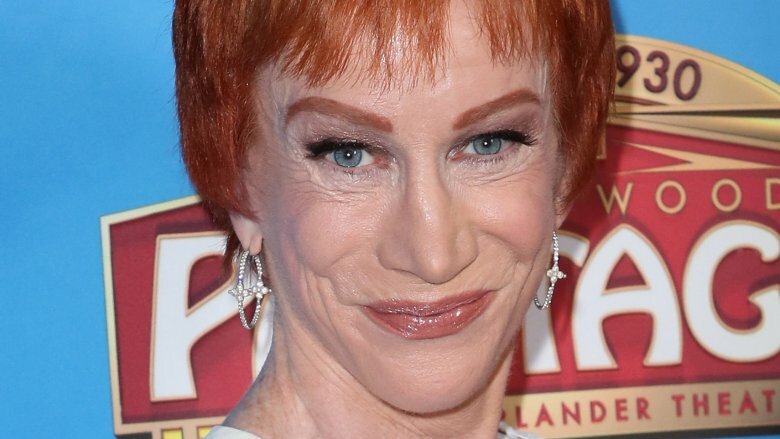 Kathy Griffin's infamous photo posing with the fake severed head of Donald Trump is a sensitive subject, considering it nearly torpedoed the comedian's career and soured a lot of stomachs for its savagery. But do two wrongs make a right? Lahren resurrected the controversy in 2018, when she recreated Griffin's infamous stunt for Halloween. Lahren dressed in a bright red wig similar to Griffin's signature 'do and held a clown mask, tweeting: "Yes, some may say I am looking more and more like Ronald McDonald by the day and you're not wrong. BUT I will stand here with my head held high! Happy Halloween from all of us infected with Trump Derangement Syndrome! MAGA!" Lahren even tagged Griffin in the post. Griffin responded, and she didn't hold back: "Gosh, you are just so original, (Tomi)!" she wrote. "I thought images like this one incite violence! At least that's what you and your colleagues at (Fox News) have told me for the past year and a half. I'm busy on tour now or I'd dress up as you: a dumb, racist and talentless hack." Tomi Lahren has criticized plenty of folks over the years, including U.S. Rep. Joe Kennedy — who she referred to as a "little nasty ginger" and "that little limp d**k" – and former president Barack Obama — whose policies she dubbed "half-baked," but one person is apparently off limits: Rep. Maxine Waters, at least according to liberal political commentator Angela Rye. Lahren slammed "Crazy Maxine Waters" for calling President Donald Trump a "disgusting, poor excuse of a man" in 2017, dubbing the California Democrat the living, breathing definition of "Trump Derangement Syndrome" and referring to the lawmaker by her first name on Twitter. Rye shot back in a chat with Charlamagne Tha God (via The Shade Room), "So first of all, don't you ever call … an older Black woman by her first name. Get it right," Rye said. "[Lahren's] coming for the wrong one." Lahren clearly hasn't heeded Rye's words. The following year, she jumped on a post of Rye's, in which the liberal spokeswoman criticized Arkansas Gov. Mike Huckabee. During the back and forth, Lahren referred to Rye as "cousin Angela" as they hurled barbs at each other. Rye eventually cracked: "Sit yo five dollar a** down. And I'm not your cousin, TAMMY." 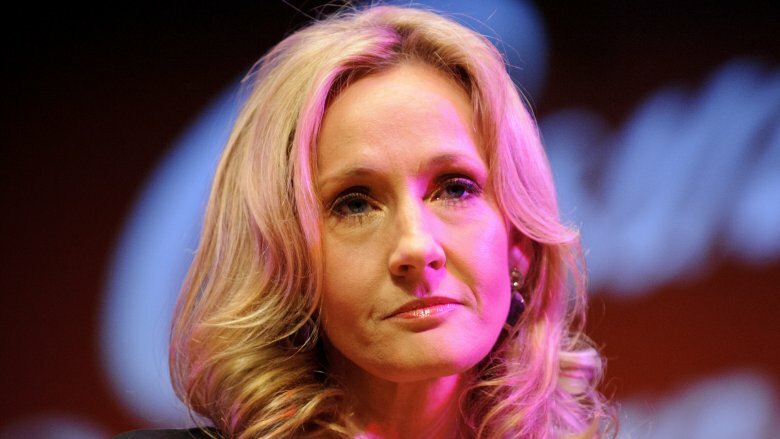 Harry Potter author J.K. Rowling got into a Twitter spat with Tomi Lahren in 2017, after the pundit shared her thoughts on Donald Trump's proposed transgender military ban. Lahren initially tweeted: "The military is not a social experiment. Finally a POTUS who understands the concept." Then Lahren added this nugget to the Twittersphere: "Pres Trump dedicated to putting radical Muslims in graves whereas Pres Obama was dedicated to putting men in the ladies room." Spoiler alert: Donald Trump has actually discussed invading women's spaces. The guy has even bragged about sneaking backstage to watch beauty pageant contestants undress. On the other hand, Barack Obama was behind the operation that killed Osama Bin Laden. That's the point Rowling was trying to make when she dished out some biting, next-level sarcasm. "Truly, whom amongst us can forget Trump ordering the killing of bin Laden? Or Obama bragging about barging in on naked beauty contestants?" she tweeted. Ten points for Gryffindor. While lambasting Beyoncé's 2016 performance at the Super Bowl, Tomi Lahren dragged JAY-Z into it, blasting him for his past as a drug dealer. "You're husband was a drug dealer. For 14 years, he sold crack cocaine. Talk about protecting black neighborhoods. Start at home," Lahren declared. 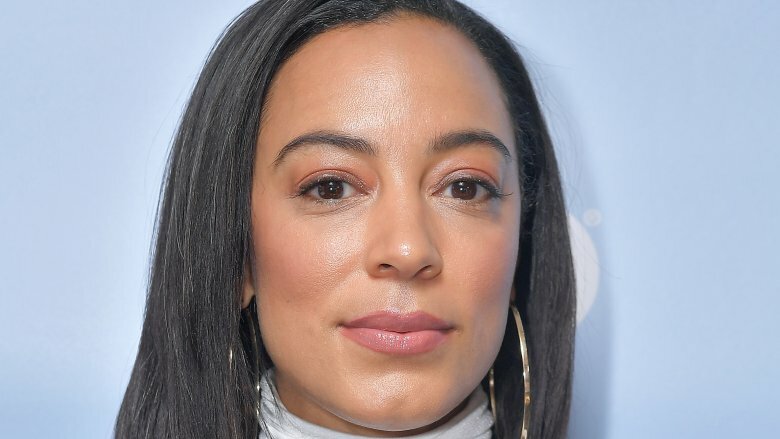 If she didn't get the memo that JAY-Z has openly and willingly addressed his past throughout his decades-long career, the "Marcy Me" rapper may have sent her another in the form of a song, Pusha T's "Drug Dealers Anonymous." 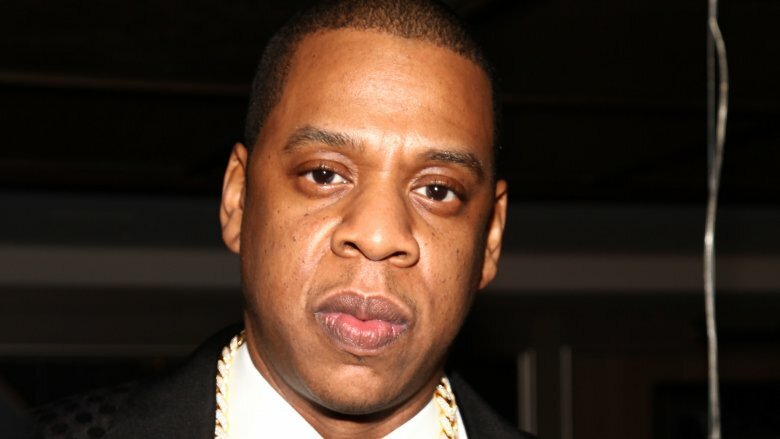 In the track, which features audio of Lahren's comments, JAY-Z fires back with the line: "14-year drug dealer and still counting" (via New York Daily News). Lahren targeted JAY-Z again after he called Donald Trump a "superbug" in 2018. She tweeted, "As opposed to you who raps about b*****s and sisters and brags about selling crack. Yeah…Trump is the problem…sure." JAY-Z didn't respond to that one, but fellow rapper Wale stepped in and told her to "sit down" (via Okayplayer). Perhaps Lahren should listen to some of JAY-Z's more recent tunes, which include themes about love, empowerment, and self-reflection. Alexa, play 4:44. Ah, yes, this may be the most iconic feud on this list. These two conservative pundits went at it on Twitter in 2018 after rapper Kanye West announced that he was stepping away from politics. According to Tomi Lahren, West's foray into politics was a publicity stunt the entire time. "The ship was doomed to sink from the start but hunger for fame & money was placed over the movement," she tweeted. 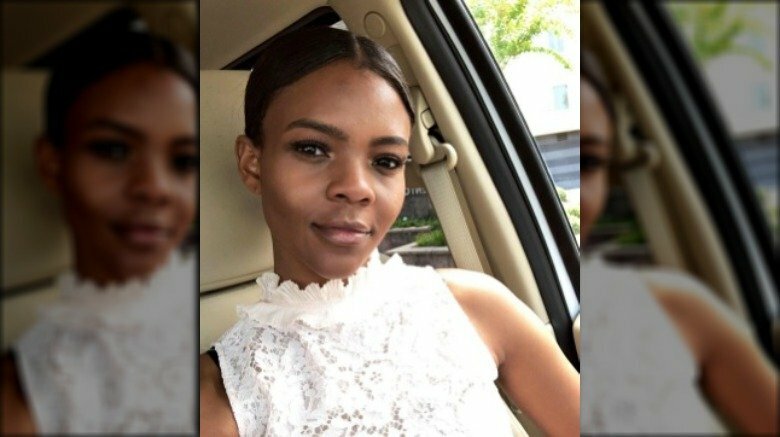 Fellow talking head Candace Owens, who is close friends with the Yeezus rapper, didn't take that so well and ridiculed Lahren for being ousted from her gig at The Blaze, alleging that Lahren was "[desperate] to be relevant again." Though at least one fan tried to calm Owens down, it was apparently too late — the alt-right provocateur was on fire. Owens continued to accuse Lahren of spreading "nasty messages" and ended the rant by calling Lahren "a vile human being behind closed doors and an intellectually bankrupt one in front of the camera" (via The Grio). Oof.